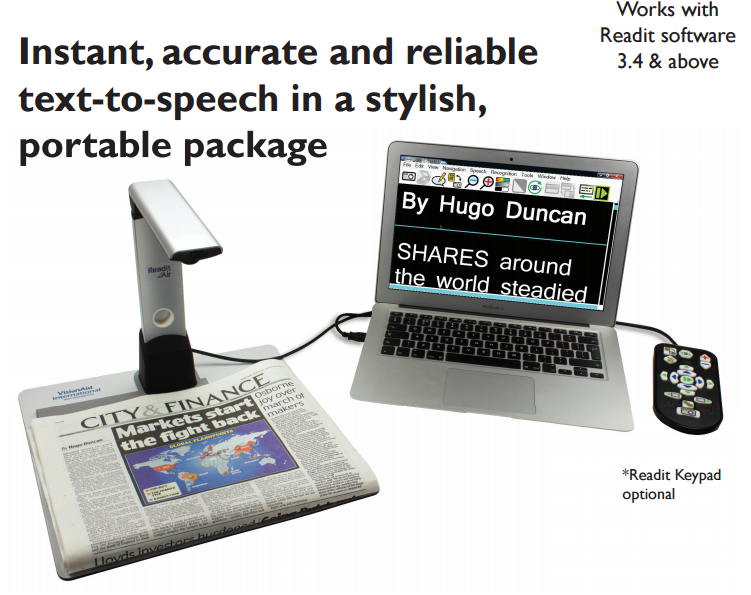 Magnify, read, re-format, import, export, save, bookmark... all in a portable, stylish product! Readit Air is a highly advanced portable autoreader / CCTV system for close up work. Weighing just 500 grams (1.1 lbs) it is the ideal solution for computer users of all ability levels. Simply place your document under the camera, press Enter on your keyboard and a few seconds later, your document is being read aloud to you, in your chosen text size, colour and formatting. Reading couldn't be easier! Who is Readit Air for? Readit Air is for any visually impaired or blind computer user (not advanced! ), who wants near instant, easy and accurate access to printed or electronic format documents. It has been specifically designed for the requirements of students, business professionals and anyone on the move with a laptop PC. Its attachable positioning guide and custom designed positioning mat also allows users with no vision at all to perfectly place and capture their documents. Are looking for something light weight and portable to enable you to read documents with the added ability to store them on your computer once captured. What are Readit Air's benefits? Users Read Faster: This is Readit Air's number one benefit. With digital capture and OCR of A4 documents, the spoken and reformatted large print text can be read over twice as fast as traditionally enlarged text from standard video magnifiers. It also allows you to read for longer periods with much less eye strain. Fast multi-page capture: 30 pages per minute capture means you can capture and store entire text books or long documents in minutes, not hours. Once they're captured, you never need to carry them with you again! Readit even remembers your position in each document when you re-open it! Ease of use: Readit Air is so easy to use. Just place your documents, press "Enter" and your document is being displayed to you and read aloud seconds later. Incredible accuracy: Readit Air uses the latest camera and recognition technology to ensure it is as accurate as possible, even on complicated documents newspaper layouts or tins of food. Glossy document capture: Many camera systems have difficulty with glossy documents but this is not the case for the Readit Air! Although it has integrated lighting, the camera and software have been optimised to capture without the lights being required, meaning even glossy magazines can be captured without difficulty. Licenses for 3 installs: Install the Readit software on up to 3 machines with every purchase, allowing the user to read in multiple locations. No X/Y table required: Readit Air's virtual X/Y table with word wrapping means once you've captured a document, you'll never again accidentally miss a line when reading. 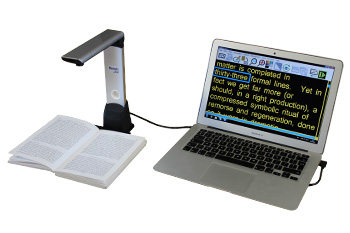 Multi-touch support: Another first for VisionAid International - Readit software is the first low vision product to full utilise the power of multi-touch on Microsoft Windows 7 to make the software more accessible. Import and Export your documents: Entire books can be stored and retrieved with the press of a button so they don't have to be carried! Import any document - PDF, Word, Email etc & read it directly in Readit. Export your documents to Word, txt, RTF, MP3. MP3 export is very useful as a revision aid. Fastest Set Up time: Readit Air has been specifically designed to be as fast to set up and take down as possible - it takes less than 10 seconds. Just unfold it, plug in one USB connector into your laptop or PC and you're ready! Nothing to screw in or plug together. No Batteries: All Readit Air needs is one USB 2.0 port - no need to worry about keeping a separate battery charged. Quality of speech: Using the latest natural sounding voices, Readit Air is clear and easy to understand. Automatic language switching: The Readit and ReadEasy+ line of products are the only ones currently available that feature the revolutionary automatic language detection and switching. This makes them ideal for users wanting to read more than one language - even on the same page! Speed: with any modern computer, Readit Air begins reading your document to you just a few seconds after it has been captured, so there's no waiting. Stylish and practical design: A stylish, light weight, folding camera, ensures that Readit Air is a pleasure to use in any locations. Footprint: Occupying just 65mm x 62mm, of table area, Readit Air takes up very little space. Weight: Readit Air weighs just 500 grams (1.1 lbs) making it easy to take with you wherever you go. Versatility: Read almost any surface, flat or round. Readit Air's camera allows it to capture deep into the spines of books without flattening them, as well as read 3D objects like tins. Adobe PDF, Image (BMP, JPEG, PNG, TIFF), Microsoft Word (DOC and DOCX), MP3, Open Document Format (ODF) plain text (TXT), Rich Text Format (RTF). Although Readit Air will function on any computer system 3 years old or newer, below is information on the minimum and recommended computer requirements.